Gliese 581g is an extra-solar planet candidate within a planetary system that is only 20 light-years from Earth, but at this point it is highly doubted to exist. First announced in 2010 as a planet close to Earth's mass in the habitable zone of its host star, the exoplanet has come under scrutiny as other research teams cast doubts on its discovery. While thousands of exoplanet candidates have been discovered, it generally takes at least two independent observations to confirm that these planets actually exist. To be scientifically rigorous, the planet should be observed by two separate teams using two different observatories. 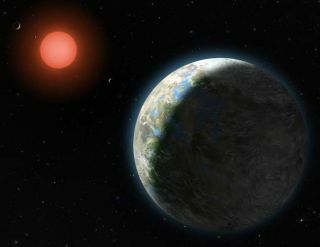 The original researchers that found Gliese 581g in 2010, however, defended their methods in 2012 and cast doubts on some of the other teams' work. At least one well-known exoplanet database doesn't list it any more. The planet is not currently listed in the Habitable Exoplanets Catalog, which is run by the University of Puerto Rico at Arecibo's Planetary Habitability Laboratory. In an October 2014 blog post characterizing “false starts” in exoplanet habitability, researcher Abel Mendez wrote that the planet does not exist. The planet was first announced in September 2010 by a team led by Steven Vogt at the University of California, Santa Cruz. Using 11 years of observational data from the W.M. Keck Observatory in Hawaii, the teams announced two planets around the star Gliese 581: Gliese 581f and Gliese 581g. Results were published in the Astrophysical Journal and also made available in pre-print version on Arxiv. The planet was believed to be within the habitable zone of its parent star, which is a red dwarf. This type of star is cooler than our own sun, which means planets need to huddle close to receive enough warmth for water to flow on their surface. While astronomers generally define habitability by whether the planet can support liquid water, it is acknowledged that there are many factors that can influence it. This includes the planet's atmosphere and how variable its parent star is in terms of emitting energy. In a press release announcing the discovery, the researchers acknowledged Gliese 581 "has a somewhat checkered history of habitable-planet claims". Two planets found in the system before, Gliese 581c and Gliese 581d, were later believed to be at the edge of the habitable zone. (In future years, Gliese 581d's existence was also called into question). Historical estimates for number of planets in the system range from about 3 to 6 planets, depending on the method used. As for Gliese 581g, the researchers said that the planet always has one side facing its parent star, and the other always in darkness. The region of habitability would likely be on the line between shadow and light. Gliese 581g was found by detecting the gravitational wobbles it induced in its parent star, but the researchers said it was subtle; more than 200 observations were required at a precision of 1.6 meters per second. The data from Keck was combined with that of another famous planet-hunting instrument, the HARPS (High Accuracy Radial velocity Planetary Search project) at the European Southern Observatory's La Silla 3.6-meter telescope in Chile. Brightness measurements of the star were also confirmed with a Tennessee State University robotic telescope. The planet's existence very quickly came under scrutiny. That October, however, a team — led by Michael Mayor of the Geneva Observatory — presented at the International Astronomical Union using more data points from the HARPS data. They saw signals for what they believed were four other planets in that system, but the information did not show Gliese 581g, they said. "The reason for that is that, despite the extreme accuracy of the instrument and the many data points, the signal amplitude of this potential fifth planet is very low and basically at the level of the measurement noise," said Francesco Pepe, an astronomer who works on HARPS data at the Geneva Observatory, in an e-mail for an Astrobiology Magazine article republished on SPACE.com. The paper was also published on preprint site Arxiv.org, but appears not to have been accepted for publication. This was a point that Vogt made in a 2012 Space.com article. He also said that his own team was unable to come to the same conclusions as the Swiss team — unless they removed a few data points. "I don't know whether this omission was intentional or a mistake," he said at the time. "I can only say that, if it was a mistake, they've been making that same mistake more than once now, not only in this paper, but in other papers as well." In 2010, a group led by Rene Andrae of the Max Planck Institute for Astronomy in Heidelberg, Germany, said that Vogt's group had based their find on assuming the planets had circular orbits, a conclusion the German team said was incorrect. In 2011, a paper was published in MNRAS based on a different statistical method analyzing the HARPS and HIRES data. This group, led by Philip Gregory of the University of British Columbia, also couldn't find a signal indicating 581g exists. In 2012, Vogt (who discovered 581g) used the same data as the 2010 Swiss team that could not find 581g. His team said that the planet is there as long as the planets have circular orbits, and said certain data points could have been omitted in the original 2010 paper by the opposing team. Vogt told Space.com that circular orbits work because “of dynamic stability, goodness-of-fit, and principle of parsimomy (Occam's Razor). The paper was published in Astronomische Nachrichten. Further study on 581g, however, cast strong doubts on its existence. In 2014, a team led by Paul Robertson, a postdoctoral fellow at Penn State University, said that Gliese 581d (another planet in the system) is not visible in the data when making corrections for its sun's activity. A press release by Penn State pointed out that sunspots could sometimes masquerade as planetary signals. The presence of Gliese 581g is inferred by looking at the orbit of Gliese 581d. If 581d isn't there after all, the researchers concluded, 581g isn't either. Another team led by Guillem Anglada-Escudé (University of London) submitted a comment on that article that was published in Science in March 2015. They said Robertson's team's work used a statistical method that "is simply inadequate for identifying small planets like GJ 581d," according to a press release of the time. Anglada-Escudé's team urged that the data be re-analyzed using a "more accurate model."